NYC, 02/07/2019, 7:00PM. 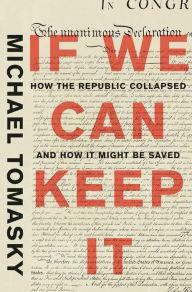 If We Can Keep It: How the Republic Collapsed and How it Might Be Saved . How has American politics fallen into such a state of horrible dysfunction? New York Times contributor and Daily Beast columnist Michael Tomasky presents a game-changing account of the deep roots of political polarization in America and offers a provocative agenda for how to fix it--from ranked-choice voting and at-large congressional elections to expanding high school civics education nationwide.